Web Design & Branding for the Financial Industry | New Design Group Inc.
Why will someone choose to put their money with you? Since the financial crisis people are very careful with whom they invest. Let’s face it everyone has been affected financially over the past ten years. Gaining investor trust is paramount for success. Creating a brand that is both memorable and professional is a huge part of gaining that trust. Now before we start developing an identity we need to step back and look at what motivates our customers when choosing an investment firm. As a marketer we know that emotional motivations are stronger than rational motivations. That means people don’t make decisions based on numbers, they do it based on an alignment with investment beliefs. Too many companies focus on financial figures such as performance or predictions. Money is an emotionally charged topic. Align your beliefs with your customers then support it with figures. Communicate less product centric and more customer centric. This alignment should be company wide and is the driving force behind your company’s brand. Formalize this with a positioning statement. This will act as the basic brief or starting point that all marketing efforts will be based on. They say success is 10 percent inspiration and 90 percent perspiration. A plan is only as good as it’s execution. Hire a professional design firm you trust. Every touch point with the customer (or potential customer) should be consistent and crafted with a clear message. Here in Canada when we think of the brand TD Bank you instantly imagine the green chair with the tag-line “Banking can be this comfortable”. All of their products and services support this umbrella statement. Scotia Bank brings to mind a consistent a mental image of their logo and tag line reading “You are richer than you think” in multi colored text. In both examples the execution is beautiful, consistent. The message is clear concise and memorable. Let’s take a look at a couple examples from the folks over at New Design Group. 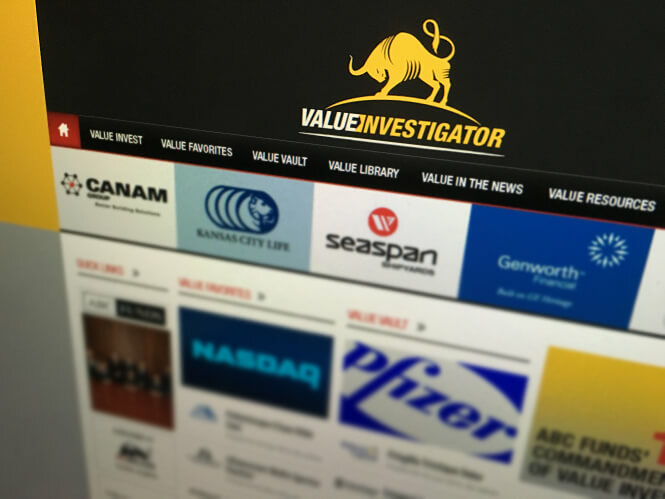 First we’ll look at Valueinvestigator.com. This site has been aligned to the investment belief that you don’t only buy good companies but you buy them at a good value. A lot of companies say this. What they don’t do though, is buid an identity around it, right from the brand name up. 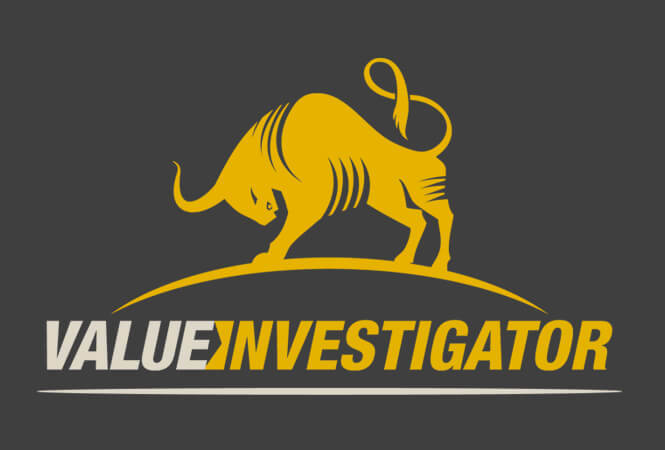 The “bull” logo is facing left, moving against the natural flow of the “Value Investigator” text. This illustrates the investment belief that value doesn’t mean you follow, rather you should think and make decisions for yourself. The biggest opportunities are not common knowledge as many might want you to believe. The website is built to arm the investor with a holistic knowledge of the companies that shape their investment portfolio. The colors are unique and energetic for a financial site yet still professional and trustworthy. Now to look at President’s Choice Financial. It’s a large company that one might not naturally connect with offering financial products. How do we leverage this well known grocery brand and link it to financial products? First with the logo. Anything under the President’s Choice umbrella is product of quality. Loblaws the parent company has invested millions to create a well know customer centric brand. When developing the logo the greatest emphasis was on the “FINANCIAL” element. At a glance the viewer needed to know this was not a grocery product. We aligned investment beliefs with a branding approach we called “Bold”. It made short witty statement that one could read while passing by with their shopping cart. The financial products offered were for the most part online. The only “bricks and mortar” was in the form of a kiosk close to the exit where a sales associate would answer questions and direct customers. Since there was little in the way of real estate they could offer the lowest rates in town and offer a rich points program that leveraged their grocery side of the business. The brand equity of President’s Choice was successfully leveraged and a financial brand built. Could all your communications be stronger with a professionally designed logo that is inspired by your company’s investment beliefs. I’ve seen too many investment companies throw good money after bad by marketing with a logo or identity that is doing more harm than good for the company. If your website is even a few years old your customers could be having a lack luster brand experience. If you are not using your site as an active channel you could be getting so much more from your website… so could your customers. How many customers are being lost simply because you are not as findable on the Internet as your competition? Are you monitoring what people are saying about you? There are easy tools to track these. What does your website look like on mobile devices? Do you have an email schedule that you are adhering to? Are you connecting events with technology? How integrated are your marketing efforts? When you give an investment package to your potential clients is it a tight cohesive package? Are your written material aligned with your sales staff? These may seem like small things but they are actually huge. Think of spending money on your brand as an investment rather than an expense. Ask yourself what would the cost be if you do nothing?